PHOENIX — Jose Osuna was the last player cut from spring training for the Pittsburgh Pirates. He made it back to the big club, though, and now he’s proving his worth. 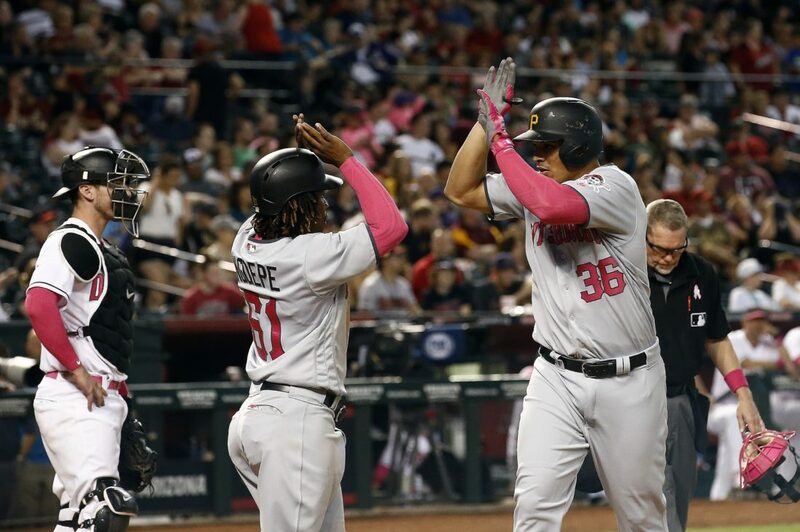 Osuna hit a two-run homer with two outs in the 10th inning and Tony Watson escaped a bases-loaded jam in the bottom of the inning to lift the Pirates over the Arizona Diamondbacks 6-4 on Sunday. Osuna hit a 3-1 pitch from Tom Wilhelmsen (0-1) out to center field, forcing a split of a four-game series. “From the first moment, I knew it was gone,” Osuna said. It was the 24-year-old Osuna’s second career homer and came after he’d been hitless in 12 straight at-bats. Watson (2-0) pitched two scoreless innings to earn the win. He got Jake Lamb out on a ground ball to second with the bases loaded to end the game. The Diamondbacks put runners on the corners with one out in the 10th after A.J. Pollock singled, but Pollock injured his right groin running up the baseline and had to come out of the game. Starting pitcher Zack Greinke entered as a pinch runner and another starter, Patrick Corbin, struck out as a pinch hitter in the inning. Slugger Paul Goldschmidt was intentionally walked before Lamb grounded out. “We had a meeting four days ago, and I said ‘Goldschmidt wasn’t going to beat us,'” Hurdle said. He almost did. Goldschmidt homered twice against Ivan Nova and leads the Diamondbacks with 32 RBIs. He homered in consecutive games for the third time this season. Josh Bell and Andrew McCutchen hit home runs during a three-run third inning for the Pirates, who gave up a 4-2 lead. Bell went opposite field to right for his team-leading seventh home run of the season. McCutchen led off the inning with a solo shot, his sixth of the year and fifth on the road. Nova pitched six innings and allowed three runs and nine hits, including Goldschmidt’s homers. Diamondbacks starter Robbie Ray lasted only four innings, during which he allowed four runs, walked three and hit a batter. Pirates reliever Daniel Hudson walked the bases loaded in the eighth, then gave way to Wade LeBlanc, who walked pinch hitter Jeff Mathis to tie it at 4. LeBlanc struck out Goldschmidt to the end the inning. “They made some good pitches, especially with the bases loaded. It would have been nice to come through but he got me looking,” Goldschmidt said. Wilhelmsen walked Gift Ngoepe before Osuna’s homer. Adam Frazier had three hits for Pittsburgh in his third game since coming off the disabled list. Lamb had three hits for Arizona, which has lost two straight. Diamondbacks bench coach Ron Gardenhire returned to the team Sunday. Gardenhire, the former Minnesota Twins manager, had prostate surgery on April 18 after he was diagnosed with cancer during spring training. Pirates: Gregory Polanco appeared to pull up running out a ground ball in the fifth inning and was replaced by John Jaso in right field in the bottom of the inning. Polanco left with discomfort in his left hamstring, but said after the game that he thinks it isn’t too serious and that he left for more of a precautionary reason. Diamondbacks: Pollock could miss some time with his injury. “I hit the ball, ran, felt a little grab,” Pollock said. “It wasn’t good, but we will see.” … After a workout and further evaluation before Sunday’s game, C Chris Iannetta was placed on the 7-day concussion disabled list, retroactive to May 13. He was hit in the face with a pitch from the Pirates’ Johnny Barbato on Friday night. Iannetta suffered a split lip, cracked teeth and broken nose. … The Diamondbacks recalled RHP Silvino Bracho from Triple-A Reno to fill the open roster spot. … David Peralta left the game after striking out in the seventh with tightness in his right glute, but said he might be able to play as soon as Monday. Pirates: After a day off Monday, the Pirates are home to start a three-game series against Washington on Tuesday with RHP Chad Kuhl on the mound. Kuhl (1-3) has one career start against the Nationals, when he gave up one hit in six innings last July. Diamondbacks: RHP Zack Godley makes his third start of the season when Arizona opens a three-game series against the New York Mets at home. Godley (1-0, 2.25 ERA) is still trying to lock down the No. 5 spot in Arizona’s starting rotation.